document R8917, 59467. I have no idea what this is or where to locate it. Re: National Archives R8917, 59467. Thank you for contacting the History Hub regarding your Revolutionary soldier. John Robuck has a digitized Revolutionary War pension file on fold3.com, R8917. 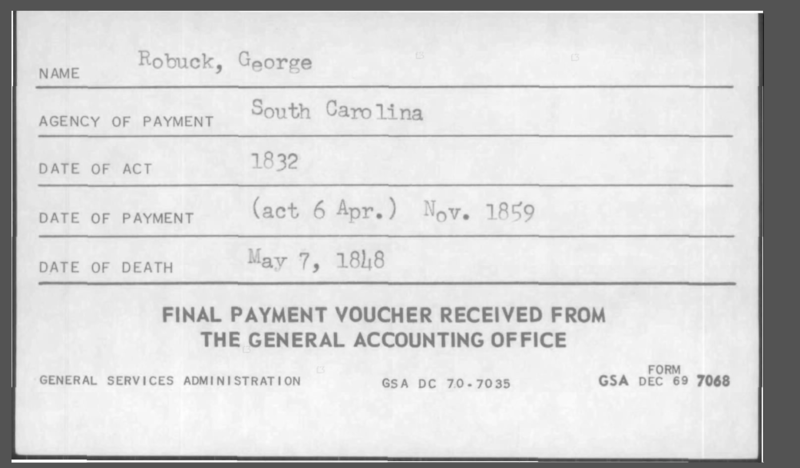 George Robuck also has a digitized Revolutionary War pension file on fold3.com, S9467. Your numbers are a typo. George has a final payment voucher index card that can be requested from the National Archives online or seen in person at our National Archives in Washington D.C.
Digitized Revolutionary War pension files are only available online (on Fold3.com only) and not available to the public in person. Fold3.com is available for free at any National Archives location or some local libraries.